If you consider tumbling and tug-of-war sports, then our annual May Day celebration exhibited some of the finest talent in North India (if you consider these a sport, you might also consider curling a sport). We practiced tumbling for weeks on thick cotton mats. We would leap and do a flying somersault over some classmate who was hunched down at the front of one of these mats. This took no skill whatsoever. But when you are dressed in white pants and a white tee shirt and there are twenty of you doing this in rapid succession…wow, it was dazzling. In fact it was all pretty tame. 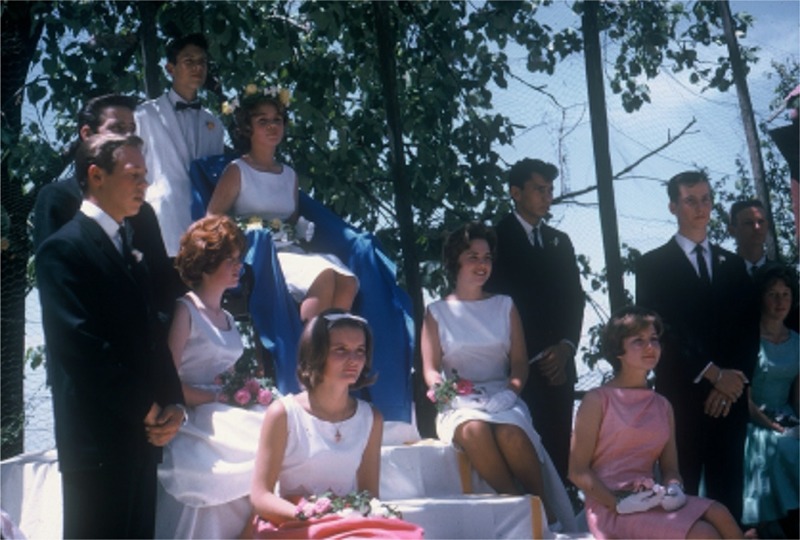 The only truly memorable May Day that I can recall was the one in which there was a well-endowed British lady sitting in the shade with a floral patterned dress on, fairly low cut. She had a single long, black hair growing out of the area between her breasts. The word got out. We casually sauntered over in groups or two or three to stand behind her to have a peek. Sure enough, a black, wiry hair sticking right out there. Which brings me to the real point of sports at Woodstock. It was actually an opportunity for everyone else not involved in running, jumping, hopping, throwing, leaping, vaulting, hitting or whatever they were doing to expend calories on the field, to sit around, chat, cheer and eat sticky things. Today we hear a lot of talk about a “level playing field“. Let me tell you, we did not have a level playing field. Hanson field, named after a deceased Woodstock alumnus who was a World War II ace (and whose picture was once featured on the cover of a Life magazine) was at the bottom of the hill, down below Ridgewood. Every monsoon a part of it would slip down the khud (the hillside) and on the other side of the field rocks and mud would pile up after heavy monsoon rains. And every year those rocks and dirt would be carted across the field to fill in what was washed away—a wonderfully balanced give and take provided by mother nature. That we had a field of any type in these steep mountains is a wonder. We used Hanson field for Sports Day, which was held each October and classes competed against each other in all manner of track and field events. Here was the deal. If you were a jock or even remotely thought you might be, you could try out for anything you wanted–hundred yard dash, 220, 440, 880, pole vault, discus, shot-put. The simple fact was that by the time we started high school we pretty much knew who was good at what. If you look at, say, my class picture when I graduated, not a single person could be considered overweight. This was because we all had to walk everywhere. Sure we had junk food available, but we also had a strictly limited allowance that simply prevented us from eating too much of the wrong thing (a small benefit of being “financially challenged” I suppose). What it boiled down to was raw genetic makeup–a natural ability to run, leap or throw things. Those genes tend to settle in greater concentration in one part of the gene pool than in another–not everyone is an athlete. But wait, all was not lost. Sure athletics was a sure route to adulation and admiration. But in our school so was intellectual prowess, and musical ability. And the band would come play marches–bold Sousa marches, for Sports Day. And if you were not a jock, and not musically inclined, you could always hope to be asked to join the class marching squad–yes, that was part of the competition as well. To qualify all you had to be able to do was walk, well… march, and know your left from your right and be able to match your left with everyone else’s left. OK. OK. If you insist and if you must know, I was not really a jock. I was kind of one. I played field hockey (had my right ear nearly torn off by a competitor at Wynberg Allen who high-sticked me. Took eight stitches. My ear was so numb Dr. Seaman—Uncle Maynard– poked it a couple of times to test it and then proceeded to sew me up without any Novocain). I played basketball. I played volleyball. And I played soccer and I did get my letter for playing those four sports. But I had notably less than average abilities in all four—someone had to be and it was me. I admit it. 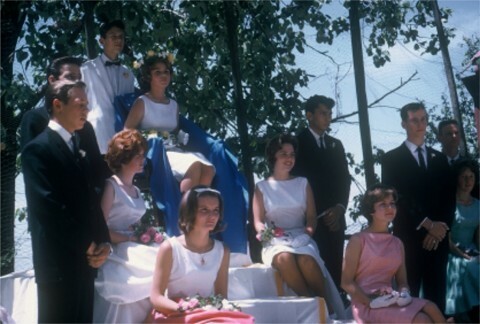 My one and only foray into track and field (please do not laugh, I still feel humiliated by this) was when in the fall of ‘66 it became clear minutes before the start of the 880 our class, the distinguished class of ‘68 had not a single runner in that race. In a flurry of finger pointing by the class captain his finger landed on me (the last of several options and the only one who did not refuse). Hero in the making I thought. My big chance, I thought. I stripped off my long sleeve shirt to my tee shirt; I was already wearing my pair of shorts as well as—fortunately– my tennies. I was breathless…and we had not even started. Adrenaline kicked in. Then the starting gun fired. We were off. Gordy, my older brother, had faithfully trained for this event for several months. I figured if I could just stay behind him the whole way, I might come out OK. I was already running cross-country, so 880 should not be that bad. On our field it was four laps. On the third lap, a bad mental lapse took place. I thought it was the fourth. Heck, I thought, in my oxygen-starved brain, I could WIN this race. I picked up the pace. I passed Gordy; I headed for the home stretch on the far side of the field. Several others followed. Gordy, the fool, kept on the track. I was going to beat my brother! I crossed the line, exhausted. I had WON. Lloyd Claassen was there laughing, pointing back to the track. Everyone was yelling. I could hear nothing; the blood pressure pounding in my ears was all I heard. And then it became clear. I had another lap to go. I wasn’t last, but pretty close. Gordy won the race, the only guy who stayed on the track while the rest of us charged pell-mell for the finish line a bit prematurely. And he had the good grace to laugh out loud really hard only once. After that it was just sniggering about the fool I had made of myself. He did a lot of that. Sports day itself was festive. 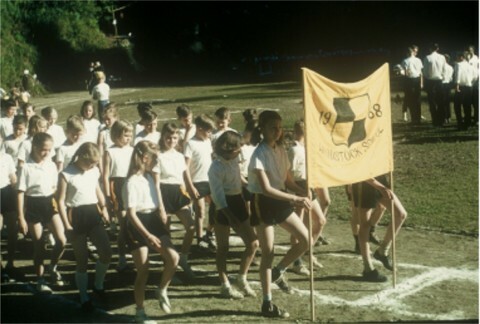 Each class had a class flag. These flags were a committee type of project and like all group endeavors it is a wonder we came to any consensus at all and a wonder that any class ended up with a flag. Untold class time was spent on voting for a particular design and color pattern. But each class just had to have a flag. Each class would march around the field, flag in front. The band, as I have mentioned, would play rousing marches, Sousa type stuff. With the entire student body of the school now on the field, we would form a gigantic “W” on the field…and then the various field events would begin. We would yell ourselves hoarse. And we would eat ourselves sick. There was a type of candy made from gur (unrefined sugar), which was dark brown, very sweet, and sticky–if you chewed it, it would pull the fillings right out of your teeth. If you had the money, there was an ample supply of sweets and pastries available. When the shadows started creeping across the field it was time to wrap it up with an awards ceremony. Silver cups, shields, ribbons were distributed to the deserving. By now everyone had had a bit too much sun and even those who had only watched were tired from just watching all the calories being expended on the field. And up the mountain we went, 1500 feet straight up to the top of the hill where we lived. 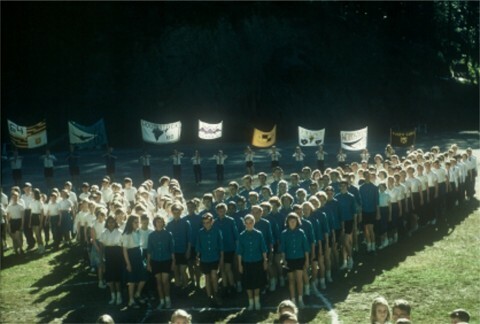 Two weeks after Sports Day, long enough for everyone to catch their breath, and for pulled and strained muscles to be nearly mended, we would have the inter-school Olympics at Wynberg. 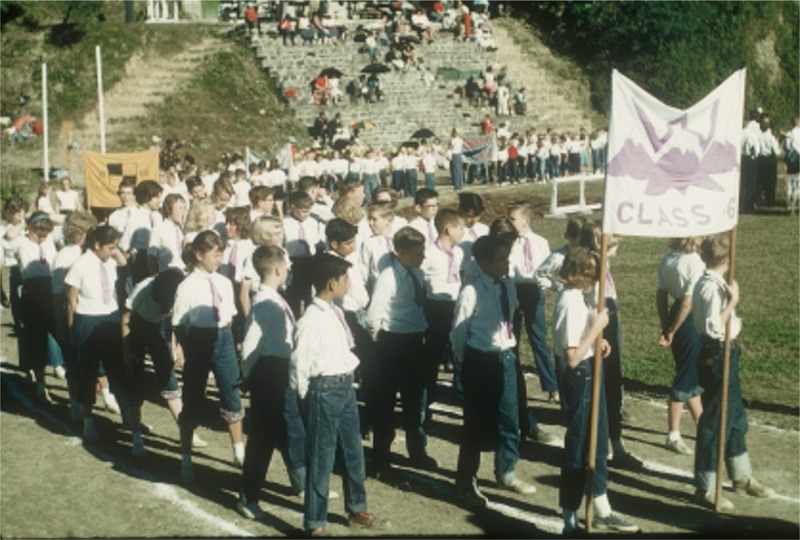 This was pretty much a repeat of Sports Day except we would compete with other local schools–Wynberg-Allen, Oak Grove, St. Georges, the Tibetan school, Waverly Convent (a girls school) and so on. More of the same food and beverages and sticky sweets and pastries and more of the same track and field events. Each school presented the best athletes it could muster to compete with the best athletes six or seven other schools could muster. 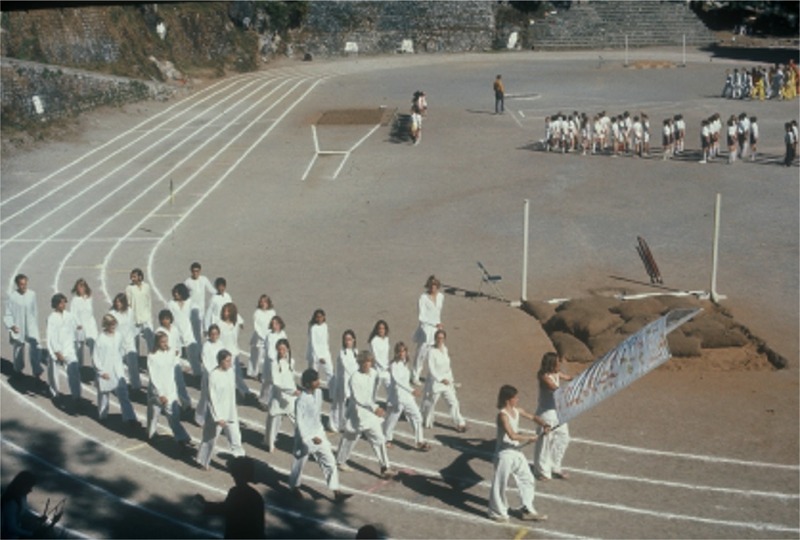 This event was always held at Allen field at Wynberg Allen School, which was on the ridge going down to Bharloghanj–the path we took when we walked down to Rajpur to catch a bus to Dehra. And that field as well was barely level. The end of the 100 yard dash was basically up hill on the far side of the field. But it was the best available and rather central to all the various schools. There were a few other fields. There was a hockey pitch at St. George’s, a Catholic boys school and our nemesis when it came to soccer and hockey. As I mentioned, we played hockey–field hockey. It was a men’s sport and actually a lot of fun, but it is a slightly smaller field than a soccer field. It would have been nice if it had been grass (none were), and this pitch was dirt and gravel. It was here that Garst, one of our fullbacks, devised one of the most unique and clever defensive strategies in the annals of competitive hockey at Woodstock School. There are two linesmen and a ref, but he discovered if he stirred up enough dirt and dust he could actually reach down, pick up the ball and heave it down the field without incurring a penalty. Their front line would be pointing and protesting while we were racing down to the other end of the field. 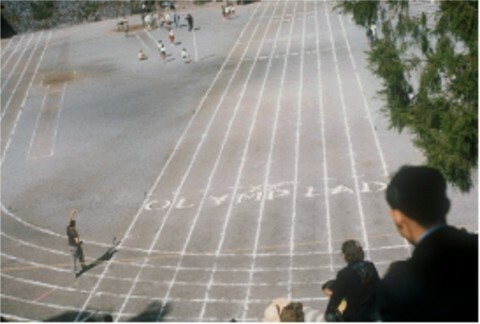 Wynberg Allen, where Olympics took place. Note the pole vault pit with the gunny sacks full of pine needles. We won nearly all pole vault events after Dan Terry’s dad brought a fiberglass pole strapped to the Cessna he flew out to India. I happened by this august seating location one Olympics and who should I see standing behind our principal, the Rev. Canon S.R. Burgoyne and his wife, but my little brother, Vernie, then around 10. Mr. Burgoyne was English and his wife American and he was a big shot, heh heh, with the Church of England. His Hindi was accented, but impeccable. I would listen to his speech in Hindi on Independence day every August at the flag pole in front of Parker Hall and was amazed and envious at all the big words he knew and I didn’t. He was also very…very….proper. He always kept the proper amount of distance between himself and the students, although he was not unfriendly. I have often wondered how and where the British learn to do this. In Vernie’s chubby little fingers was a single blade of grass. I knew immediately what he was doing. I watched as he slowly edged forward and extended his hand and the tip of the blade of grass came to rest on Canon S.R. Burgoyne’s neck. Mr. Burgoyne slapped his neck. Vernie eased back and you could see his body begin to shake from laughing without laughing out loud. He did it again, this time in the ear. Slap! Now this little piece-of-grass-as-an-insect trick was making the rounds about then. We were all used to keeping insects off of us. You didn’t have to look. You felt something you smacked it. Finish. Chota Lal, our cook, had watched us do this grass-blade insect-trick and decided to try it himself. The previous week in the bazaar he had come across a crowd of some sort (there was always a crowd somewhere watching something–trained monkeys, a snake charmer–or buying some huckster’s special cure-all). He did this cute little trick a time or two on some unsuspecting chap in front of him to his great amusement. All of a sudden the fellow turned around, caught Chota Lal red handed with arm extended with blade of grass in hand and, beginning with sala (you do not want to know what it means), proceeded to use every descriptive and vile phrase in his repertoire. When telling us what happened, and with a little encouragement from us, Chota Lal attempted to repeat that stream of invectives and vulgarities and I must say it was pretty complete. It created quite a little scene the way he described it. He thought the fellow was going to follow the verbal abuse up with a little physical action, but he didn’t. Vernie eased forward again. Behind him other dignitaries were elbowing those next to them and pointing, waiting for the next round of reaction from our principal, Canon S.R. Burgoyne. Ever so gently under the ear by the front of the neck. Whack. I was mesmerized. I wanted to warn Vernie of certain and impending doom–stop while you are ahead! At the same time our principal was being made a fool of and that did not happen very often. This was worth watching. Sure enough, the slightly too persistent insect finally caused Mr. Burgoyne to turn around and catch Vernie in the act. People were laughing. Mr. Burgoyne realized that he had been made sport of to the amusement of many. With a hearty laugh he said, “Off with you now, lad.” Vernie, with not a little fright showing, scurried off. .
May Day. Sports Day. Olympics. Who won is long forgotten. The atmosphere, the friendships, the candy, the sunburn and…sportsmanship are long remembered. The Olympics field at Wynberg from the approximate location where the dignitaries sat each year.